Pickup Some Creativity: Thank You! 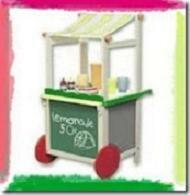 An Almost Unschooling Mom surprised me with the Lemonade Stand Award. Although I can't forward it to others right now, I had to say thank you to her for her thoughtfulness. She does an amazing job coming up with fun and challenging activities for her SIX children, whom she homeschools. I think she is an inspiration.